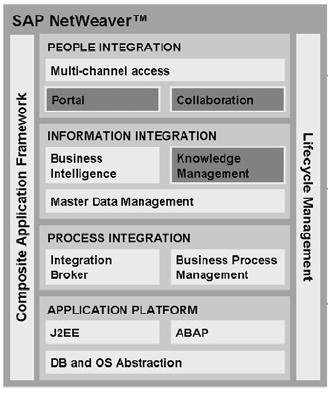 The enterprise portal is the front-end component for SAP NetWeaver. It offers a single point of access to SAP and non-SAP information sources, enterprise applications, information repositories, databases and services in and outside your organization—all integrated into a single user experience. Portal enables a user to bring individual web applications into portal as an integrated view(iview). The user can then display and use the applications from a page in portal along with other iviews from other applications and systems. Different types of iviews allows the user to embed different types of content from diverse information sources. Thus it provides a single point of access to all info. An important feature of Portal is that it allows a user to login to portal once and there after start applications and network login sessions without further authentication requests. This is called Single Sign On(SSO). An Enterprise Portal is an interface for people to access and exchange information online. It is usually customizable and can be designed to provide employees, customers or trading partners with the information that they need, when they need it. 1. Utility application: services that support the full. 2. Content and document management: Services that support the full life cycle of content and document creation and provide mechanisms for authoring, approval, version control and scheduled publishing. Some portal solutions providers aim to remove the need for a third-party content management system. 3. Collaboration: portal members can communicate synchronously (through chat or messaging) or asynchronously through threaded discussion and email digests (forums) and blogs. 4. Search & Navigation: Content is meant to be read, so on the usage side of the equation, being able to find and retrieve targeted content is the essential task. As more content is added to repositories, the more valuable those repositories become. Unfortunately, retrieving useful information becomes more difficult as the volume of information grows unless effective search and navigation methods are employed. 5. Personalization: the ability for portal members to subscribe to specific types of content and services. Users can customize the look and feel of their environment.Customers who are using EIPs can edit and design their own web sites which are full of their own personality and own style; they can also choose the specific content and services they prefer. Like My Yahoo. MSN. 6. Entitlement: the ability for portal administrators to limit specific types of content and services users have access to. For example, a company's proprietary information can be entitled for only company employee access. 7. Integration: The connection of functions and data from multiple systems into new components/portlets. 8. Single sign-on ( SSO ): Many enterprise portals provide single sign-on capabilities between their users and various other systems. This requires a user to authenticate only once. Access control lists manage the mapping between portal content and services over the portal user base. 1. Centralization: EP provide a centralised system that may contain a wide range of a company’s corporate information and access to online applications. This centralised information system enables customers or employees to easily access information such as reports, application forms or policy documents. Furthermore, it is easy for the individuals within the company to update or edit content. 2. Increase productivity and profit: information and time is money. A Centralied and well organized information system provided by EP can help employees get quick response and information that increase employees’ productivity. In addition, it can offer customers easy access to resources that may increase the company’s sources of customers. 3. Provide security area: EP has one significant feature which is providing a security area that for team or a specific partner to access, which means only authorised users can access restriction information.